Merida's Warp 5 is a bike for those who want to get serious about their time trialling, but who don't want to break the bank… just yet. When it comes to first time time trial steeds there are plenty of options to chose from. Plus you need to bear in mind that time trialling is a game of constant tweaking, honing and, hopefully, improving not just of your fitness and position but your equipment too. So deciding on what is the right point at which to jump in and spend some serious money is the question the aspiring time triallist needs to answer - do you spend it for where you are now, or where you think you might be six months to a year down the road. Merida hope the Warp 5 is the perfect answer to such ponderings – and if nothing else it certainly looks the part, turn up to your local club 10 for the first time and you won't feel out of kilter and you will be taken seriously. That's part of the job done, but what is it like to ride? When I first saw this bike my initial impression was ‘doesn’t look bad for the money’ and for an introduction into time trialling, that wasn’t going to dig too deep into your pockets, this would be a safe bet. Mind you, that's when I was guessing the price to be around £1200 (the price of the Merida Warp 4). The Warp 5 this is nearly £200 more than I thought and normally I'd consider it a touch salty, but these aren't normal times – the cost of bikes is going up not down for the first time in years. At 22lbs he Warp 5 is not a light weight, but that’s not all that important if it is mainly going to be ridden along flattish courses it shouldn't be too much of a problem even if you are going to take it over the odd lump, I found it both responsive and stiff and it kicked well up the hills. This bike would not in my opinion be suited for drag strip short tests – 10 and 25miles. It’s a bit too urpright for my liking. It would however be great for longer time trials or even a 12hr perhaps. Over those distances the flawless operation of the drivetrain would really help you establish a rhythm so that you can get into a groove over long flat sections. Anyone buying this bike would find it a great introduction to time trialling or, better still, triathlon. That question still remains though, if I was spending this kind of money, would I better off buying say a top Ribble carbon compact, with a Carbon Centaur groupset (which looks like last year's Chorus to me) and add clip-ons? And it could be used as a road bike. Tricky one really, but there again I'm used to building up my own bikes. For someone who isn't and wants to open a box and ride the next club 10, the Warp 5 fits the bill. Bike you ride most often? Best bike (if not the one above)? Flandria FCS1 – Campag Record/Neutron Ultra plus a Fondriest TT bike with all sorts of wheels and a Daccordi Steel retro – Campag Record Delta Groupset. If you time trial what is your PB? Have been sub 4hr for 100, can still knock out a 56 min 25 on a good day and can give a good account of myself on the Chain Gang. I liked the ‘cable faring’ – all cables were concealed – looked very neat. The only thing was it wasn’t easy to check cable tension when setting the bike up but this was a relatively minor problem. Some of the graphic work was a bit ropey – but as I said before, good for the money. A bit bigger than I’m used to - 56cm as opposed to 54cm c –c so found it hard to get into the position I’m used in terms of saddle to stem difference – felt a bit ‘sit up and beg’ but I was able to adjust the position and get a bit lower. Reach was okay, but it was not possible to alter the tri-bar extensions and hence found myself stretched out too much. If it was my bike, a hack saw would be in use! Handling was generally fine, although because of the upright position it did take a while to get used to. Also, due to the amount of ice around I didn’t take too many corners ‘criterium style’ so wasn’t able to truly evaluate it’s cornering prowess but it did feel sure-footed and I’m positive it wouldn’t create too many unwanted surprises. Was there any toe clip overlap with the front wheel? No problems here, the geometry was fairly conservative – much more so than my own TT bike. Also indicated by the amount of clearance between the brake callipers and wheel – more in fact than my winter training bike – see photos – plenty of room for mudguards I reckon… It does raise the question of whether this is really more of a road frame made to look like a time trial one and possibly falling somewhere between the two as a result. Did the bike feel stiff in the right places, but comfortable where it counted? It did feel stiff in the right places, I tried the usual standing on the pedal trick to watch the bottom bracket flex, then compared it with my own TT bike (which is a smaller frame) and couldn’t see any difference. The bike became more comfortable and lively after the first 10miles or so. First impression was it was ‘dead’ in comparison to my normal bikes but then most strange bikes feel like that to begin with. In fact I quickl grew to like the bike and found it did accelerate well and felt responsive up the hills. Better choice of handlebar configuration, and positioning of the stem in relation to the saddle would have improved matters no end for me personally. Just stiff? If so, was it stiff and efficient? Did it cause you any discomfort? Very little discomfort – even the saddle which looked awful, was surprisingly comfortable. Which components (including the frame) contributed most to the efficiency and comfort of the bike? The frame and the drive train. Which components (if any) most detracted from the comfort and efficiency of the bike? 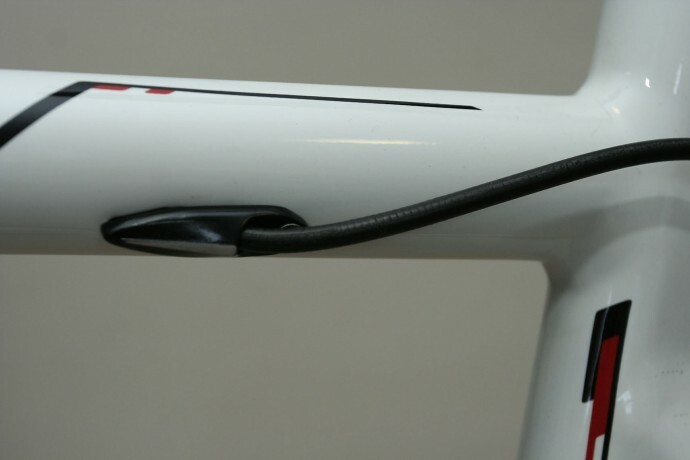 The brake levers are appalling, verging on dangerous – see photo. They are very thin section and the ends could have that proverbial eye out in the wrong set of circumstances. I was pleased to be wearing thick winter gloves otherwise prolonged braking could have become a pain… literally. That said, they did stop the bike well enough. I would certainly be filing down the pointy ends if it were mine. Did the bike accelerate quickly from a standing start? Acceleration was quick due mainly to the stiffness of the frame (plus the power in the riders legs of course!) and the drivetrain. Did the bike accelerate quickly for a sprint? Not a bike designed for sprinting being a TT bike but I’m sure it would kick okay. Did the bike feel stable at high speed? Yes, no problems here either on the Tri-bars or on the hoods. Did the bike feel stable at cruising speed? Did the bike feel stable at low speed? How did the bike behave when cornering on the flat? Felt sure footed in the dry. I'm not a fan of Vittoria Rubino tyres in the wet, (although others on the team don't have a problem with them). I'd view the Rubino as a budget tyre but plenty of bikes at this price point seem to come with them fitted as original equipment – the Orbea Onix in on test has them too. How did the bike behave when cornering on descents? Riding a TT bike with a lot of ice around little confidence in the tyres, it was hard to tell, but given the way the bike handled in other situations with better tyres it would be very good I’m sure. How did the bike perform on climbs? Once again, pleasantly surprised considering that this is no featherweight – 22lbs including pedals (Keo Carbon). Would you describe the steering as neutral? Hard to say with Tri-bars – nothing worrying though. Were there any situations where the bike handled differently than it generally did? No, it was all pretty good and as the miles clicked by, the better it felt. Which components (if any) contributed to the positive handling traits of the bike, or did most to overcome any negative ones? The gear change and drive train worked faultlessly. The brakes were very positive but shame there was no lateral adjustment of the brake shoes, as it proved impossible to get one mis-aligned block parallel to the rim – see photo below. Weight 7/10 heavy but not so important for a TT bike. 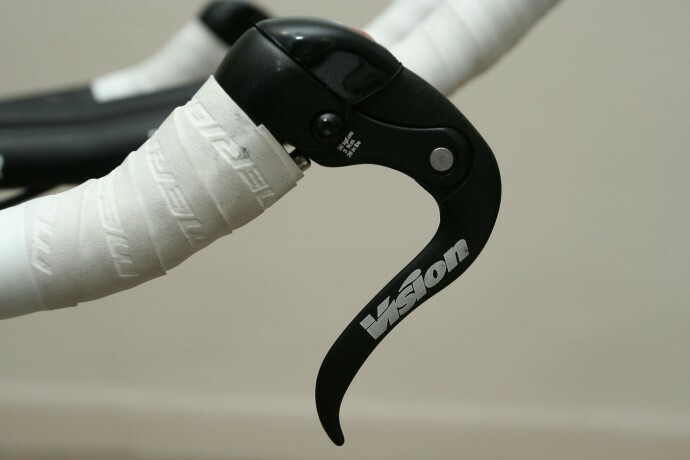 Comfort 2/10 – those brake levers! Worst(bits) if any? Brake levers – horrible. I assume a shop bought bike comes with arm rest pads? Did you enjoy riding this bike? Would you recommend one to a friend? Yes for someone starting out in time trialling but there is a lot of choice.